Hi Gulfstar owners. We have a Gulfstar 44 cc and are contemplating the purchase of a RIB. We have davits but want to store the dingy on deck for crossings. We are wondering about the largest RIB we could store on the foredeck. Any of you guys have experience with this? Did some basic measurements already. Will get more datapoints this weekend, and compare with dingy dimensioned drawings. It is still hard to envision exactly how it will fit upside down, inflated or deflated, etc. I suggest you get a drawing with measurements of various RIBs and a plan of your deck at the same scale and see what fits. If you can't do that I will help you if you send the to scale drawings. 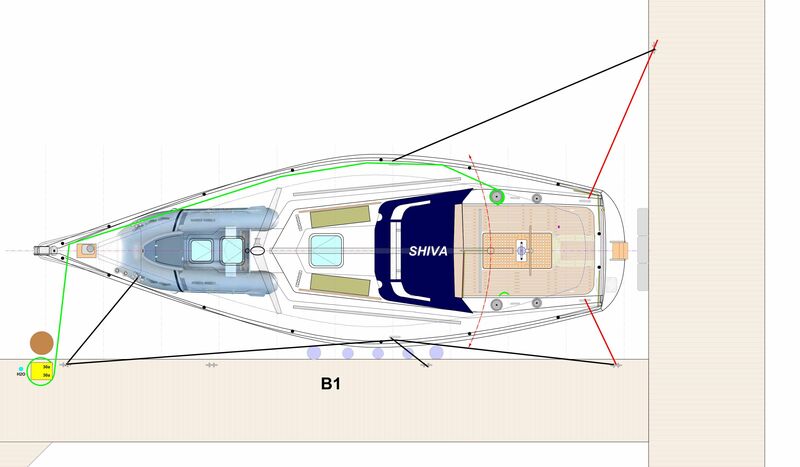 Even a top photo of the RIB can be scaled and superimposed on you deck plan. Something like the attached. Found a pic of my RIB... scaled it and put it on a CAD layer below a drawing of the deck. Of course it's not upside down and you can see the deck hatches which the dink would cover. The RIB is obviously too big for the foredeck when sailing..
Last edited by SanderO; 01-29-2019 at 04:56 AM. Had to look at a pic of the G44 and see there is a raised coachroof that extends over most of the foredeck, in front of the mast. No doubt a RIB will fit up there, but perhaps it will extend off the front of the roof. Frequently, a RIB on the foredeck destroys access. Captain's choice on whether that's acceptable. Take some measurements from your fav RIBs and put a tape measure to your deck. Not much more to it. If you're concerned about the usefulness of your deck on passage, or the ability of your foresail to tack, you're going to have to resign to a foldable that you can store for crossings. As for generic dinghy dimensions, I find an 8ft inflatable to be pretty small and bare minimum. One couple only and not great for exploring. 9ft is about where I would start for all around use. 10ft starts getting pretty nice for a crowd/groceries/etc, but obviously eats up deck space. Regardless of size constraints also consider the weight of a RIB which once you get over 8 feet can increase greatly. A compact 8 or 10 foot RIB can be less than 100 lbs while a 13 foot Zodiac Futura Aluminum RIB is 276 lbs and that does not include the weight of the motor, etc which can more than double the weight of the boat. The larger the RIB the larger the minimum sized motor required to move it. How much additional weight you can load on the bow without impacting the handling of heavy seas and weather may be the more critical measurement. Pick the dinghy and motor is good thinking. Motor size depends not only the particular dinghy but also area and type of usage. Have had to tow small enigined dingies when there are wind/waves running against them. Fun being a Good Samaritan but tough on those in under engined dinghy. May need max rated hp if using for stores or transporting multiple people or will be on plane for long runs. Thanks, SanderO. I can see how a CAD drawing of your deck can come in handy for multiple projects. I discovered I can store my 10' RIB upside down on the deck in winter. And it's not a bad idea as I can keep the hatches cracked a bit for ventilation. However getting to the bow cleats is well nigh impossible. This winter I stored the dink on the dock near the boat. Were I to go offshore I would not take this RIB as much as I love it. Won't tow and can't stow... might be a bit smaller deflated and maybe I could get forward... but I doubt it and could rig the storm jib so it's a no go on the fore deck. I would buy a dink down in the islands or have one shipped from the states. After the can it fit quandary many then go through how the heck do I safely lift an X hundred lb RIB up into the fore deck without hurting myself or damaging the boat however before that you have to consider that you may be dealing with more than a 10 hp outboard which up to 20 is going to be over 100 lbs and once you get over 25 hp you are talking over 200 lbs just for the outboard. Storing a 50 to 80 lb dinghy and then a 30 to 50 lb outboard is something that most can handle by themselves however over 100 lbs really requires two people to safely handle even on dry land and over 200 lbs dead weight should employ a lift when done from the deck of a boat. You now also have to store that larger heavier outboard somewhere. Then the logistics of limited access to the fore deck comes into play as SanderO brought out when anchoring, docking, dealing with the jib, etc. Will you be able to safely deal with setting the storm jib or other foul weather tasks while a rib is on the deck? We get ribs offered for donation because while they do technically fit on the deck they just took too much room while sailing and were causing too much damage when they took them off or loaded them on the deck or the process of rigging it up to the halyard to drop it in the water and then rigging up an outboard on the boom to set it in place just took too long plus then having to do the reverse when you were done. If you already have davits that fit your existing dinghy you may be better off just rigging it more securely and keeping the deck clear and accessible. You might consider putting some cardboard boxes stacked in the basic shape and size of the RIBs your considering to get a feel for how having it there may impact operating the boat before you make any investments.